The sadistic enjoyment of watching the Birthday Boy/Girl’s comfort level plummet as he/she is obnoxiously sung to and clapped at before receiving a mediocre, but hopefully comped dessert. Usually in the form of: a) “Molten” Lava Cake (Chili’s), b) créme brulée (Upscale Chili’s), or c) ice cream scoop with candle (Japanese restaurant). Cashing in on the comp’d lunch and cake at work while the Birthday Boy/Girl wishes they were a million other places. 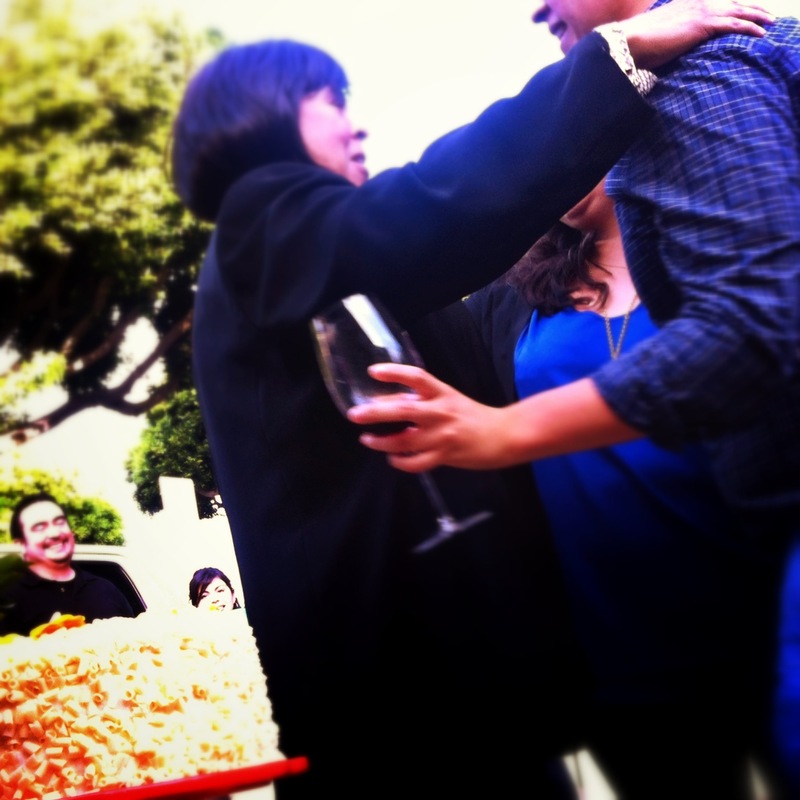 The Pay-it-Forward feeling when signing that “Hope all your wishes come true! XOXO” card. Ultimately, we get to sing off-key, stay “x” years young, eat cake, and revel in the celebrations at the expense of the celebratee. Bystanders’ win. Of course we don’t get presents or anything, which kind of rock, but cake! We get cake! Preheat oven to 325 degrees. Grease and flour 3 8″ round cake pans. In a large bowl, combine sugar, flour, cocoa, baking powder and salt. Whisk buttermilk, eggs and vanilla in a separate bowl. Melt butter in the hot coffee in another small bowl. Beat half of the buttermilk mixture into the dry ingredients. Beat in half of the coffee mixture. Scrape the batter down the sides of the bowl. Beat in the remaining buttermilk and coffee mixtures. Evenly pour batter into the prepared pans and bake for 25-30 mins, or until the cakes spring back when lightly pressed. Allow to cool in the pans for 10 mins. Cool completely (or freeze) before frosting. To make filling, combine all ingredients (except vanilla, coconut and walnuts) in a small saucepan over medium-high heat until thick and bubbly – about 12 mins. Cool lightly and add the rest of the ingredients. Let cool completely before spreading on cake. I’ll take any excuse to bake. Any family event, obscure holiday or (even, on occasion) less cryptic conventional birthday – I’m your girl to stock up the dessert table. Qunceñera? Bar Mitzvah? Filipino Debut? Holler! (I happen to specialize in celebrations of acute cultural rites of passage.) Just give me a reason to party and I’ll whip up 10-20 of my most crowd-pleasing sweets, no questions asked. I lived up to this promise this past weekend, and was promptly schooled in the most recent craze to hit the Pinterest boards of mothers-to-be across America: the Gender Reveal Party. I’ve been lucky to have been informally adopted by the best Mexicans this side of the border (if I’m an honorary Mexican, I can say that right? ), one of whom which is expecting! To commemorate such an exciting event, we decided to kick off the second trimester with a Gender Reveal Party, á la chic-mama-of-2013. Here, the doctor contacts a third party while the mother- and father-to-be are kept in the dark about the baby’s gender. That third party (a very responsible, extremely reliable, and incredibly trustworthy person) creates some type of big reveal shrouded in blue or pink to announce the gender amongst friends and family at said Gender Reveal Party. I (naturally having all the qualities listed above) was honored to be chosen to create the big reveal. Typically, the parents-to-be cut into a deceivingly iced cake that is blue or pink on the inside, so I was the clear Panadero China for the job. 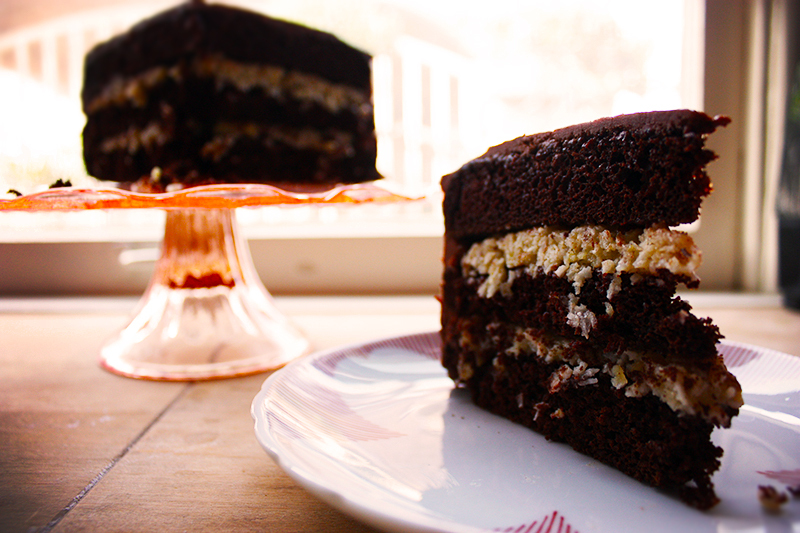 This was my first attempt at making a layered cake, so being the neurotic baker that I am, I did my research. Turns out you just need to utilize your freezer and channel your inner zen: lots of patience and lots of taste-testing. Its really not that difficult, actually – especially when you’re baking for such a momentously fun event. I was just a little off-put by the radically saturated food coloring, but the damn thing still tasted pretty bomb, if I do say so myself. I ramble like the cake was the centerpiece of the party, but it was really just a vestibule to announce the greatest news thus far in 2013. I am so insanely excited for the parents-to-be and their new baby girl, and was just so happy to be included in their fabulous celebration! I also designed the invitations, baked three types of brownies, two types of shortbread and got my mom to bake for the event – but that’s all small potatoes, really. I CAN’T WAIT TO MEET YOU, BABY LEE! Butter and flour three 8-inch round cake pans. In a large bowl, whisk together flour, baking powder, baking soda, and salt. Set aside. In the bowl of an electric stand mixer fitted with a paddle attachment, beat butter and sugar at medium speed until pale and fluffy, about 3 to 4 minutes. Add eggs one at a time, beating well and scraping down the bowl after each addition. Beat in vanilla extract. Turn the mixer speed to low and add half of the dry ingredients. Add half of the buttermilk and beat until just combined. Add the remaining flour and buttermilk and beat until just combined. Remove the bowl from the stand mixer and finish incorporating the batter with a spatula. Scrape the bottom of the bowl to make sure there is no butter or flour hiding down there. Fold in the chocolate chips. Add any food coloring if need be. Divide the batter among the cake pans. Spread batter evenly in each pan then rap each pan on the counter top to help the batter settle and eliminate any air bubbles. Bake until bubbled and golden brown, about 20-25 minutes. Insert a skewer into the center of the cake. Cool cakes in the pan for 10 minutes before inverting onto a wire rack to cool completely. When the cakes are cooled completely, place on cake boards, wrap in saran wrap and freeze for 30 mins to an hour. To make the frosting, combine heavy cream, powdered sugar, cream cheese and lemon zest in the bowl of a stand mixer fitted with a whisk attachment. Beat on medium speed until soft peaks form. Once soft peaks form in the whipped cream, keep an eye on it. Continue beating just past the soft peak stage. To assemble the cake, place three strips of parchment paper onto a cake plate or cake stand. Place one cooled cake round atop the parchment paper. Level with a large knife. 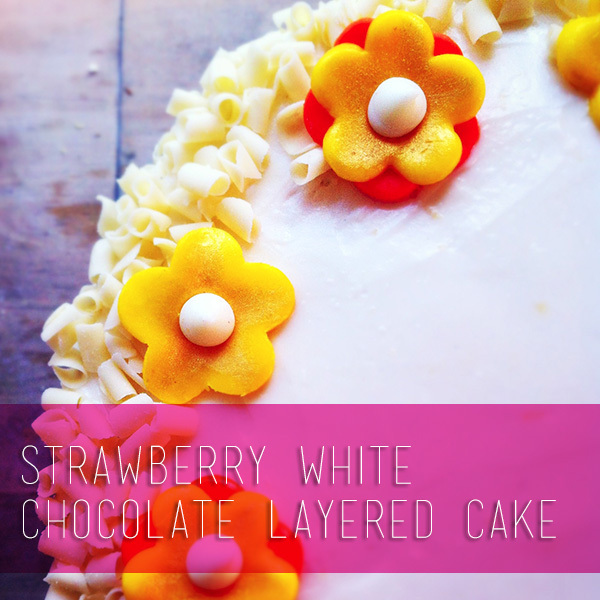 Spread a generous amount of whipped cream atop the first layer. Arrange half of the sliced strawberries atop the whipped cream and sprinkle with half of the finely chopped white chocolate. Level the second (middle) cake layer and place atop the frosted layer. Top with more whipped cream, the remaining sliced strawberries, and sprinkle with the remaining white chocolate. Top with the last cake later. 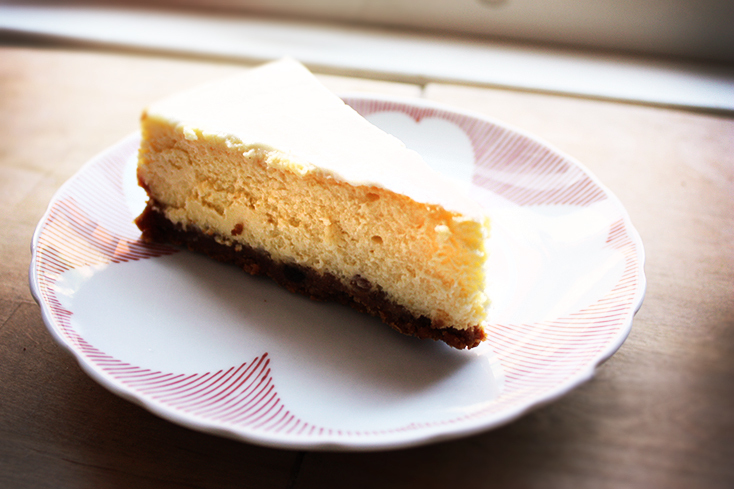 Spread whipped cream across the top of the cake and smooth along the sides. This is your “crumb coat.” Freeze the entire cake for 30 minutes. Make the icing: In a medium bowl, cream together the cream cheese and butter until creamy. Mix in the vanilla, then gradually stir in the confectioners’ sugar and lemon zest. Take the naked cake out of the freezer and gently smooth the icing over the gently frozen crumb coat? Wasn’t that easy? I decorated with shaved white chocolate and fondant flowers brushed with edible gold powder. NBD. I appreciate diversity. I actually require diversity in every facet of my life – e.g. demographically, culturally, dietarily, in social circles, trail mix, and (of course) in dessert options. 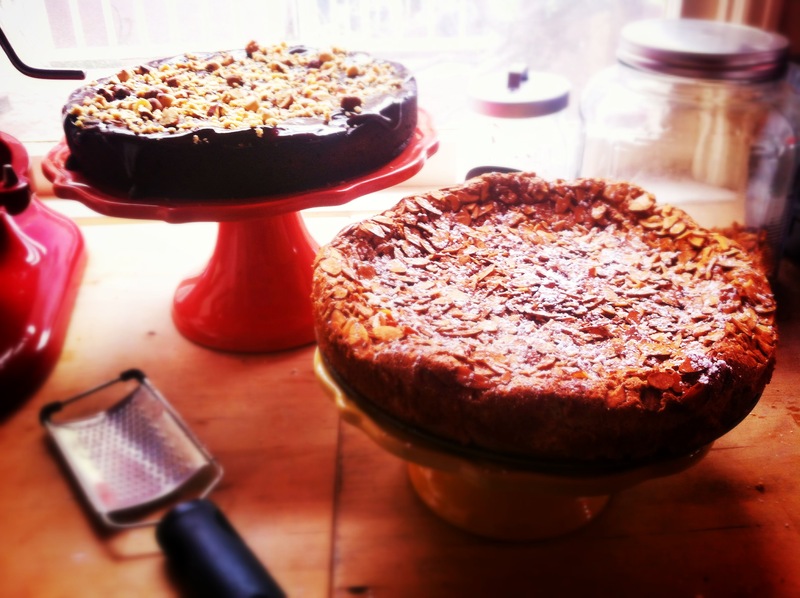 Following suit, I recently made these two flourless cakes for a dinner party and then subsequently to celebrate a lovely coworker’s birthday the next day – a total multitasking baking win for no leftovers! 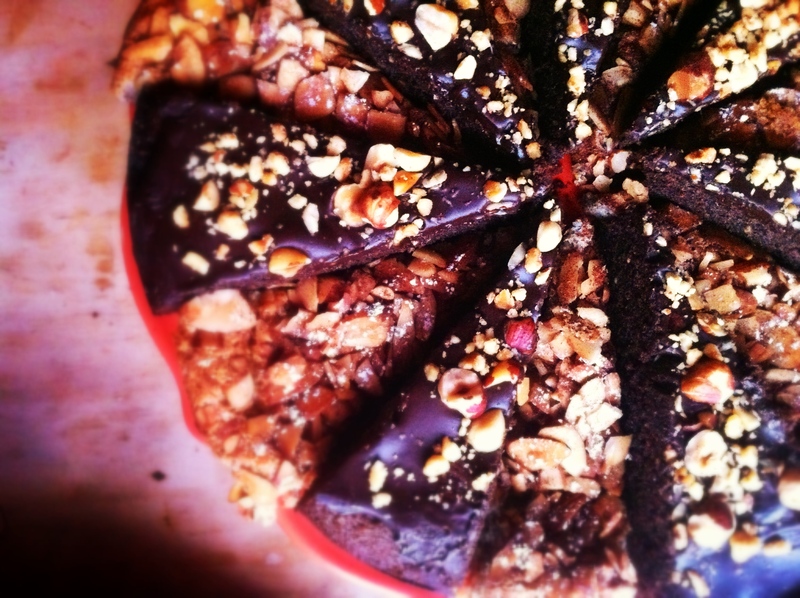 The first is a chocolate lover’s dream: a deceivingly light Nutella cake with hazenut dark chocolate and a rich ganache. The second: an airy cinnamon snacking cake made with almond flour, then topped with roasted almonds and dusted with spices. Both are gluten-free (’tis the craze these days, so let’s hop on that bandwagon), using nut flours that I whipped up in my mighty mighty Vitamix. All hail the all-powerful Vitamix! The importance of diversity is really about balance – anything too homogenous automatically becomes uninteresting (and unappetizing – 50 filet mignons in an aluminum vat, gross). Also, I firmly believe that as a baker we can adopt the model that too much of a good thing – when accompanied by other good things – is never a bad thing. People appreciate their options! Adapted from Nigella’s iphone app Nigellissima (beautifully done, btw), also seen here. Preheat the oven to 350°F, and grease the springform cake tin and line the base with baking parchment. In a clean, grease-free bowl, whisk the egg whites until they are opaque and start to hold their shape, then slowly add the sugar, whisking until it’s all incorporated and the mixture is thick and shiny. Add the almond essence and the clementine or orange zest. Then, in about 3 goes each, alternately whisk in the oil and the almond meal (mixed with the baking powder) until they are both smoothly incorporated into the meringue. Pour the mixture into the prepared tin, then mix together the flaked almonds and cinnamon and sprinkle them over the top of the cake. Bake for 35-40 minutes (though start checking at 30), by which time the top should have risen and be set and the almonds become golden, and a cake tester should come out clean, barring the odd almondy crumb. Remove from the oven and let the cake cool in its tin on a wire rack. Once it is no longer hot, spring open the sides of the tin, but don’t try to remove the cake from the base until properly cool. When you are ready to serve, dust with powdered sugar. Preheat the oven to 180ºC (degrees Celsius). In a large bowl, beat the butter and Nutella together, and then add the Frangelico, egg yolks and ground hazelnuts and set aside. In a separate bowl, whisk the egg whites and salt until stiff but not dry. Fold in cooled, melted chocolate to the Nutella mixture, then lighten the mixture with a large dollop of whisked egg white before gently folding the rest, bit by bit. Pour into a greased 23cm/ 9 inch round and lined springform tin and cook for 40 minutes or until the cake’s beginning to come away at the sides, then let cool on a rack. Toast the hazelnuts in a dry frying pan until the aroma wafts upwards and the nuts are golden-brown in parts: keep shaking the pan so that they don’t burn on one side and stay too pallid on others. Make the ganache: put a heavy-bottomed saucepan onto the stove and add the cream, Frangelico (or water) and chopped chocolate. Stir continuously until the chocolate has melted. Take it off the heat and whisk until it reaches the right consistency (should be a smooth cream like texture). Release the cooled cake from the mould carefully, leaving it on the base (as it is wet and heavy and will break). Slowly glaze the top of the cake with the chocolate ganache. 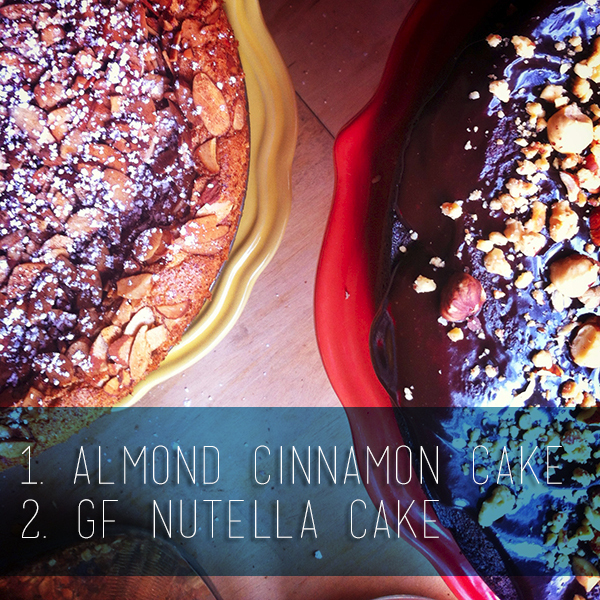 Finish it all off by placing the toasted (and cooled) hazelnuts onto the cake. One of the things I love about getting a CSA box is that it forces you to get a little adventurous with your meals every once in a while. (What can I cook with beet greens? How do I cut a butternut squash? What the hell do I do with all these oranges?? #bougieproblems) Now, I’m definitely not saying these are daredevil-like risks we’re taking here, just a little push to get out of the weekday safety meals. As noted in a previous post, I received a festive box of fresh cranberries in my last shipment from Farm Fresh to You, so never having cooked with them before, I hit the blogosphere for inspiration. 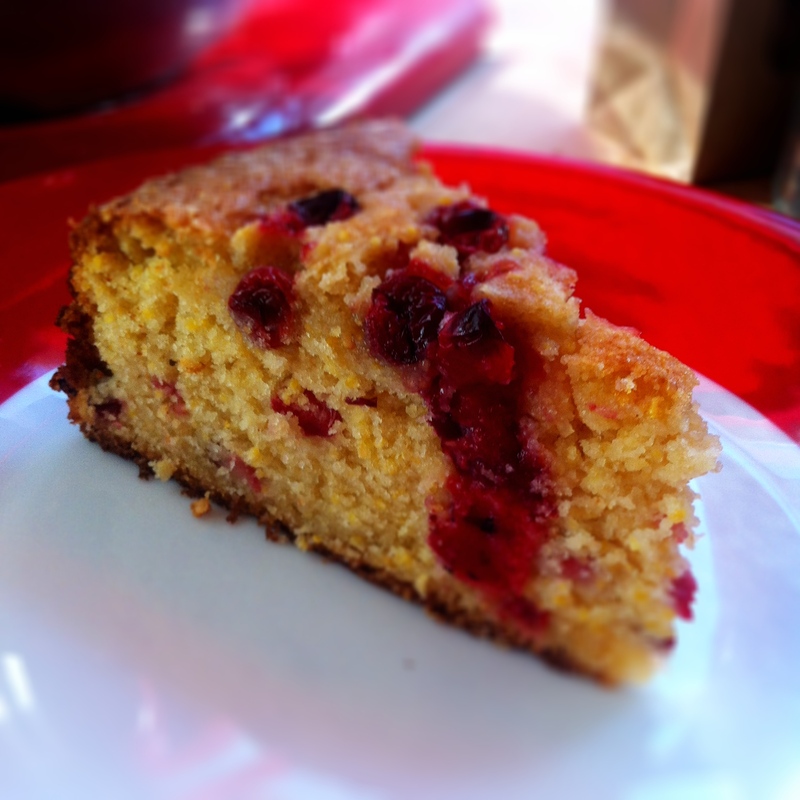 After a solid hour had past (this is why I don’t need a television) and a good twenty recipes had been added to my food board on Pinterest, I found a recipe in the LA Times for this cranberry orange cornmeal cake. It is perfection. I am drawn to simple, no-fuss recipes with equally low maintenance ingredients and prep time, and this one definitely fits the bill. 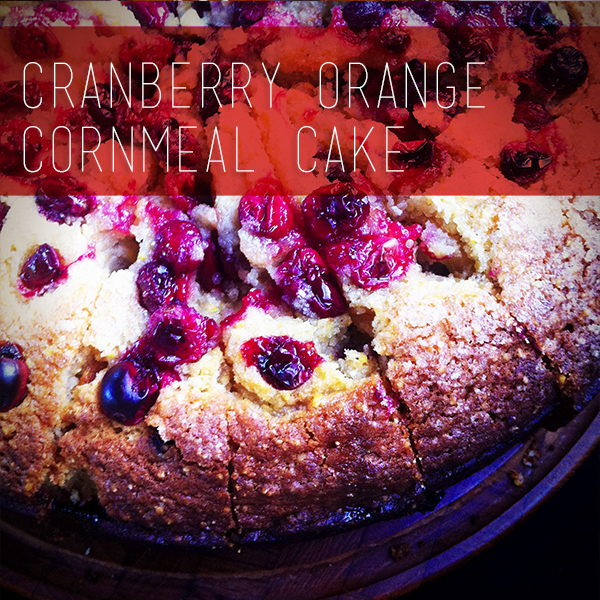 This cake is a little bit country and a little bit rock ‘n roll: the cornmeal creates a lovely homey texture, and the cranberries give a tart little kick. The ricotta is the secret ingredient that makes the cake super dense and ridiculously moist-two adjectives used only on rare (and lucky) occasions when describing cornbread. To top it off, I drizzled a bit of honey over the cake after pulling the it out of the oven. It just seemed right. This cake is also not too rich or too sweet, which makes it a perfect ending to a heavy holiday meal. Especially when accompanied with a dollop of vanilla ice cream. Just sayin. Heat the oven to 375 degrees. Grease a 9-inch round by 3-inch tall cake pan and line the bottom with parchment paper. In a medium bowl, whisk together the flour, cornmeal, baking powder and baking soda. In a separate medium bowl, whisk together the eggs, maple syrup, oil and vanilla. Set aside. In the bowl of a stand mixer with the paddle attachment, or in a large bowl with a hand mixer, cream together the butter, 1 1/2 cups sugar, salt and zest. Mix just until thoroughly combined; do not overmix. With the mixer running, slowly incorporate the egg mixture into the butter just until combined. With the mixer on low speed, add one-half of the flour mixture to the batter and quickly mix for 5 seconds. Turn off the mixer and add the rest of the flour, the ricotta and one-half of the cranberries. Mix the remaining ingredients into the batter over low speed just until combined, being careful not to overmix. Gently pour the batter into the cake pan and smooth the top. Scatter the remaining cranberries over the top of the cake, and sprinkle with the remaining 2 tablespoons sugar. Bake the cake until a toothpick inserted comes out clean, about 1 hour and 15 minutes. 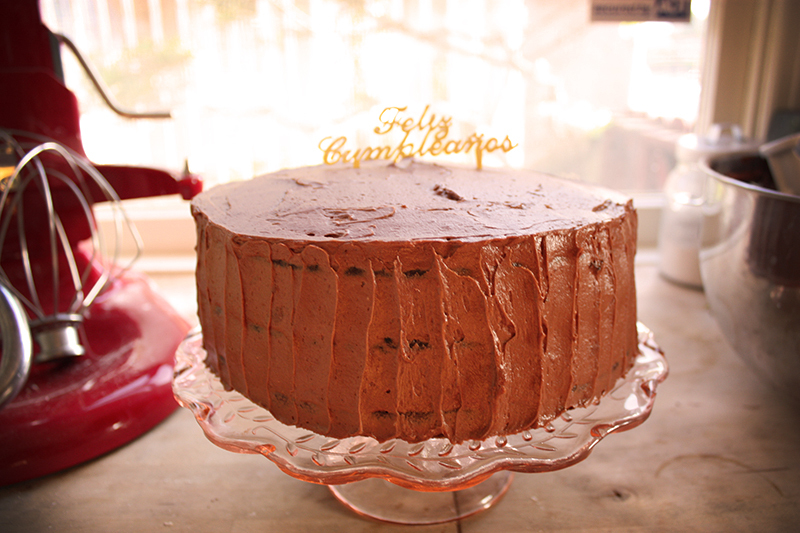 Place a loose piece of foil over the top of the cake if it starts to darken. Cool the cake on a wire rack before removing it from the pan. Buttermilk is a peculiar substance. Milk already unnerves me to no end, so obviously its thicker, sour-smelling cousin further creases my brow. However – and speaking from experience – baking with the stuff proves to be incredibly lucrative. The acidity and consistency of the buttermilk makes denser cakes, richer breads and fluffier biscuits. The byproduct of butter-making, buttermilk is fermented longer than plain milk (gross), producing a high acidity that tenderizes the gluten in the batter (less gross, still wildly unappealing) to give baked goods a softer texture and more body (I’ve forgotten everything – hello gorgeous, and get in my belly!) Also, because most of the fat has been removed to make butter, buttermilk has a far lower fat content than its all-American whole/vitamin D counterparts, which TOTALLY makes up for the copious amount of butter and sugar used in the recipe that follows. Clearly, I am the Bill Nye of buttermilk. 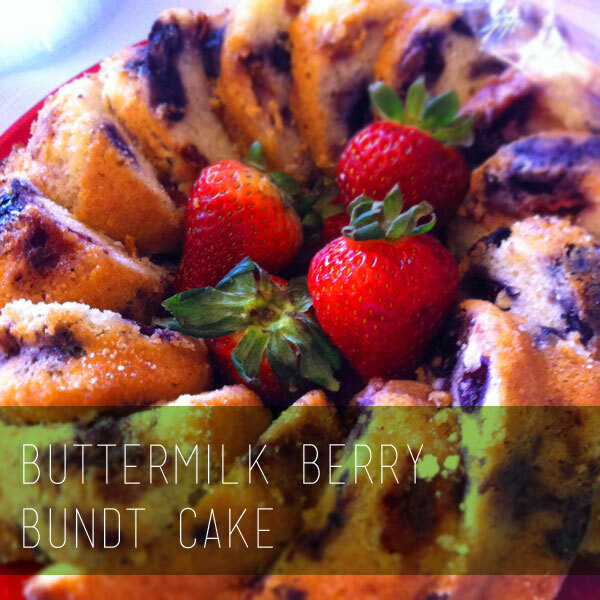 The point of all this is that the use of buttermilk is completely justified by and glorified in this Buttermilk Berry Bundt Cake. 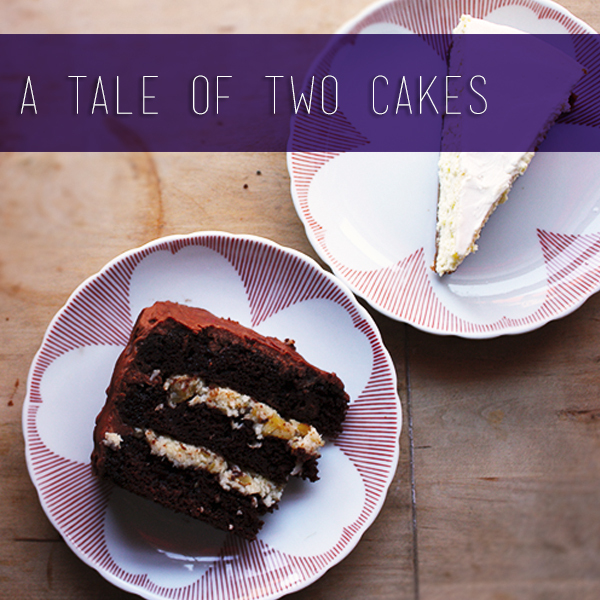 Even though it is such an easy recipe, the richness and density of the cake will make your eaters think otherwise. Let the buttermilk do all the work for you and (note to self) don’t think it about it too much. Preheat your oven to 350°F. Grease a bundt pan with coconut oil. I like to use a paper towel to get it all the crevices and limit the mess. In a medium bowl, whisk or sift flour, baking powder and salt together and set aside. In the bowl of a stand mixer or large mixing bowl, cream together the butter, sugar and lemon zest until light and impossibly fluffy (3 to 5 minutes). Then, with the mixer on a low speed, add your eggs one at a time, scraping down the bowl between each addition. Beat in vanilla, briefly. Add 1/3 flour mixture to batter, beating until just combined, followed by half the buttermilk, another 1/3 of the flour mixture, the remaining buttermilk and remaining flour mixture. Scrape down from time to time and don’t mix any more than you need to. In a separate bowl, toss the berries with the remaining 2 tablespoons of flour, then gently fold the berries into the cake batter. The batter will be very thick and this will seem impossible without squishing the berries a little, but just do your best and remember that squished berries do indeed make for a pretty batter. Plop the batter in the pan in large spoonfuls in the prepared baking pan and spread the top smooth. Bake for 55 to 60 minutes, rotating the cake 180 degrees after 30 (to make sure it browns evenly). The cake is done as soon as a tester comes out clean of batter.